Lash caps increase the diameter of slender valve tips. On race engines running skinny 6 or 7mm valves, lash caps allow the nose roller of the rocker arm a greater footprint on which to operate. 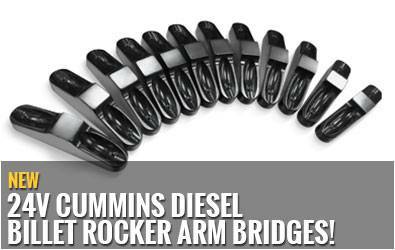 They are also synonymous with titanium racing valves, so prevalent in Dirt Late Models, Dirt Modified, and Sprint cars, protecting their vulnerable valve tips from direct rocker contact. 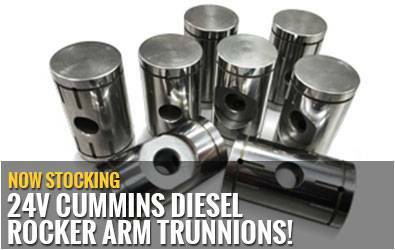 Titanium valves improve engine acceleration. Long gone are the days of the heavy valve trains and their attendant camshaft profiles. Lighter titanium alternatives cultivate the use of lighter valve springs, lighter retainers and different camshaft lobe profiles that change ramp speeds and reduce valve lofting. 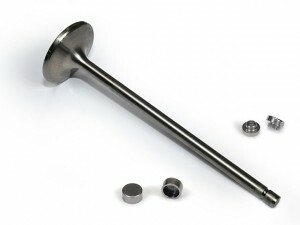 Mike Androwick of Mike’s Racing Heads says, “Though titanium valves are expensive, around $140 per valve, with a hard coating they usually last a full 2,000-lap race season.” In contrast, Nascar Sprint Cup engines receive new titanium valves every race. Androwick, whose racing cylinder heads are currently leading the Dirt Car points in the Northeast Modified series, uses a chromium nitride coating on the valve for longevity. “It adds hardness to the valve and consequently they last a lot longer, especially with unleaded fuels or E85.” But when you hear of a lash cap that has been shed from its valve tip you wonder how it happened and if such hazards can be averted. “With a lash cap, says engine builder Jon Kaase, “the nose wheel of the rocker must operate at its center. If it operates too close to the edge, it can cause the lash cap to tip back and forth. As a result it will wear the end of the valve—the valve tip—in an arc; it will also wear the sides of the valve stem where the lash cap operates.” It follows therefore that the lash cap will be loose and dance around as there’s nothing to hold it properly in place. If you break a lash cap during a racing weekend you can usually fix it without dismantling the motor. But if you have a similar mishap with a pressed-in hard tip, you are obliged to remove the cylinder head and install a new valve. 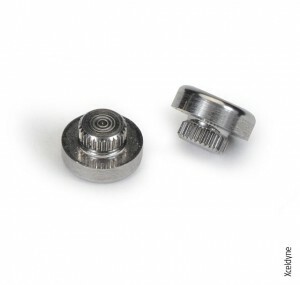 Pressed-in hard tips are also commonly used to protect the tip ends of titanium valves, and engine builders are divided in their opinions as to which one is superior. Kaase remarked, “I generally use lash caps as my own experience suggests there is less to go wrong. I’ve seen hard tips break off sometimes: the head separates from the post. I’ve also seen them come loose. This usually occurs when the valve train has been over-revved and the valve closing events get out of control, which results in a lot of hammering. And what lash cap troubles have you seen? Inserting pressed-in hard tips in the valve’s stem-ends is a critical operation. Drilling the hole too deep weakens the valve around the keeper groove—a transgression that promises imminent trouble. Inserting pressed-in hard tips in the valve’s stem-ends is a critical operation. Drilling the hole too deep weakens the valve around the keeper groove—a transgression that promises imminent trouble. “Some teams have experienced lash caps splitting across the top,” comments Andy Anderson of Trend Performance. “Though unlikely, I suppose it is possible to receive a batch that is overly hard and brittle as result of poor heat treatment. “But much more prevalent is sloppy machining. The tops of the lash caps must be parallel; that is, the face that contacts the valve and the face that contacts the roller of the rocker arm. If the tops are not parallel the tapered surface causes an uneven loading—a side loading—that deflects the valve stem. And if the lash cap isn’t flat and parallel it won’t rotate on the valve. Worse still are lash caps that are too big, those that are a loose fit on the valve tip. At Trend Performance’s new North Carolina facility, they maintain flatness and parallel requirements by completing all of the machining processes in one clamping. Moreover, they found it pays to use a through-hardened premium tool steel for the manufacture of lash caps. 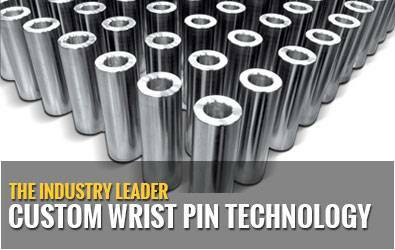 Although Trend produces their lash caps from through-hardened tool steel, as mentioned earlier, commonly they are made from alloy steels and case hardened. Invariably, lash caps are supplied with around 0.001in operating clearance, which allows them to rotate on the valve stem tips. 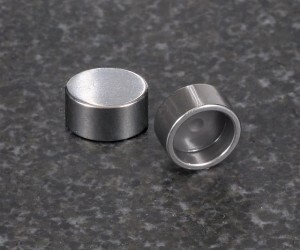 To date the Asheville specialist manufactures lash caps to suit valve stems of 7mm, 0.310 and 0.311in. All are available in three thicknesses: 0.060in, 0.070in, and 0.080in.